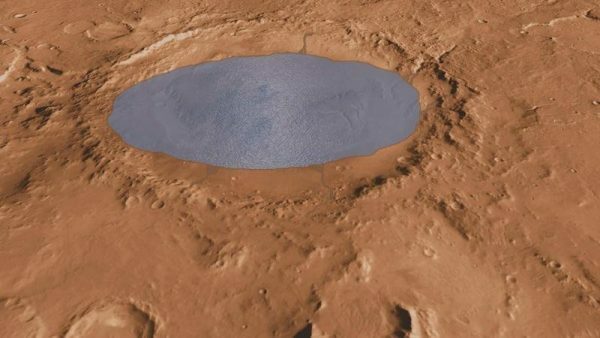 Underground Lake Found on Mars. Using observations spanning a period of four years, a team of researchers from Italy found evidence of a large lake of salty water, buried one mile beneath Mars’ southern polar cap. That lake is at least 12 miles across, and seems to be a permanent feature. We now know that there is permanent liquid water on Mars, according to a paper published Wednesday in the journal Science. Using observations spanning a period of four years, a team of researchers from Italy found evidence of a large lake of salty water, buried one mile beneath Mars’ southern polar cap. That lake is at least 12 miles across, and seems to be a permanent feature. But until today, the evidence of modern water all pointed towards fleeting moments—droplets condensing on the Mars Phoenix lander; or evidence of brief outflows of salty water in Martian valleys. Perhaps the most famous is Lake Vostok—one of the world’s largest lakes, buried and hidden away. But the one to which I want to draw your attention is named Lake Whillans. But maybe, just maybe, that life would have been able to follow the water—to move underground, where it might have found a niche, in a dark salty lake, buried beneath the ice of Mars’ southern polar cap.